Hurricane Florence, perhaps the strongest storm to hit the US in decades, may bring disastrous flooding to areas of the eastern United States. More than a million people were under evacuation orders in the eastern United States Tuesday, where powerful Hurricane Florence threatened catastrophic damage to a region popular with vacationers and home to crucial government institutions. South Carolina Governor Henry McMaster ordered as many as one million coastal residents to leave their homes ahead of the storm’s projected arrival on Thursday. Schools in 26 of the state’s 46 counties were ordered closed from Tuesday. The governor of neighboring North Carolina ordered an evacuation of the Outer Banks, barrier islands that are a popular tourist destination, and parts of coastal Dare County. Trump approved emergency declarations for the Carolinas, a standard move allowing the release of federal funds and equipment to aid in protection and recovery efforts. Hurricane Florence has the potential to bring disastrous flooding to areas of the eastern United States already soaked by heavy rain. It may be the strongest storm to hit the region in decades. Florence was about 405 miles south of Bermuda and its center was forecast to move between Bermuda and the Bahamas through Wednesday, before approaching the coast of North Carolina or South Carolina on Thursday, the National Hurricane Center (NHC) said in its 8:00 am (1200 GMT) advisory. Although the maximum sustained winds of Florence had decreased, re-strengthening is forecast “and Florence is expected to be an extremely dangerous major hurricanethrough Thursday night,” the hurricane center said. Nurse Barbara Mack was using a small shovel to fill sandbags at a public works facility in Charleston. Also out for sandbags was Deborah LaRoche. Half her supply was going to barricade a basement soup kitchen she managed, and the other half to protect her own home on nearby Johns Island. Early Tuesday, authorities began closing inbound lanes of Interstate 26 into Charleston to help facilitate the traffic flow of those wanting to get out. The US Navy was sending about 30 ships stationed at its major bases in Virginia out to sea. The vessels would get underway from Naval Station Norfolk and Joint Expeditionary Base Little Creek to avoid potential damage from winds and tidal surges, said Colonel Rob Manning, a Pentagon spokesman. United States Coast Guard officials also ordered commercial vessels and pleasure craft to take precautions. Heavy rain in the Washington area over the weekend has already led to flooding in historic Alexandria, Virginia, which on Tuesday was under a coastal flood warning, along with the shoreline of Washington. “This is a huge storm,” said Robert Woodward, chairman of the Dare County Board of Commissioners. 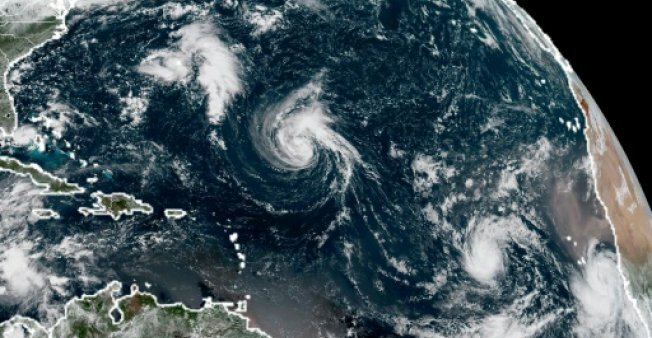 Helene — 620 miles west of the Cape Verde islands off the African coast – had winds up to 110 miles per hour, and was expected to continue moving west-northwest for several more days, the NHC said. Isaac — which late Sunday became the fifth hurricane of the season, but was later downgraded to a tropical storm – is heading west toward the Caribbean. Despite the slight drop in maximum sustained winds to 70 miles per hour, Isaac is expected to be at or near hurricane strength as it passes near land later this week. The storm was about 880 miles east of the Lesser Antilles – a region still recovering from last year’s powerful Hurricane Maria.